Complex cases with high esthetic needs represent a challenge for clinicians. A multidisciplinary approach is vital to achieve the planned result. New technological devices are needed to facilitate the collaboration between the clinical team members and to develop a fluent and effective diagnostic and therapeutic pathway. 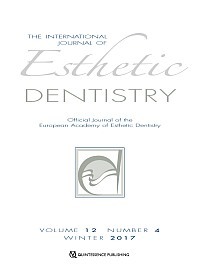 This article describes a well-defined protocol for the treatment of complex esthetic cases with the use of ceramic laminate veneers. The protocol involves different branches of dentistry: periodontal therapy, mucogingival surgery, restorative dentistry, orthodontics, and prosthodontics. Each step of the protocol should be executed in a very strict order: intra- and extraoral esthetic analysis of the patient, with photographs; digital previsualization by means of Digital Smile Design (DSD); clinical previsualization by means of a mock-up; orthodontic, mucogingival, and endodontic treatments, if needed; minimally invasive tooth preparation, driven by a mock-up and silicone indices; manufacture of ceramic laminate veneers; try-in and adhesive cementation. In this article, this protocol is illustrated by a clinical case report in which all the above-mentioned steps were carried out. The finalization was obtained by means of state-of-the-art adhesive techniques and ceramic laminate veneers. The correct use of modern materials, in combination with rigorous adhesive procedures, allows for a minimally invasive and highly esthetic treatment, with adequate function and a perfect integration that is in harmony with the patient's face. One of the main difficulties encountered with conventional class IV direct composite restorations is the layering management in terms of three-dimensionality and shape control. The major concern is the predictability of the esthetic outcome, which is closely linked to the clinician's skills. This article presents a predictable approach to treat class IV direct composite restorations. The technique allows for the shape and thickness of different composite layers to be guided through transparent indexes that have been carried out previously on a planned wax-up. The final goal is to achieve a good esthetic outcome in an easy and fast way through a copy-and-paste approach. The "index cutback technique" is a complementary variant of the "index technique" for class IV direct restorations. After the casts have been generated, the technician creates a full wax-up of the tooth to be restored. A transparent silicone key of the full wax-up provides the full enamel index that is then cut with a blade along the incisal edge to achieve two enamel indexes, one palatal and one buccal. Then, the required amount of wax is removed from the full wax-up through a cutback step. The aim of this step is to remove a suitable amount of wax to leave a predetermined space for the composite enamel layers, both on the palatal and buccal surfaces. A second transparent silicone key is built on the cutback wax-up to achieve the cutback dentin index, which is then used to press the composite dentin onto the prepared tooth. When planning a restoration, the color of the substrate should also be taken into account in order to achieve a satisfactory esthetic outcome. In some clinical situations, clinicians are asked to hide the substrate with the restoration; in other situations, clinicians can take advantage of an unaltered color substrate and therefore select less opaque materials that exploit the color of the underlying tissue. Several treatment options are described in the literature to solve the microdontia-related problems of maxillary anterior teeth. These options are often focused on an orthodontic rather than a restorative approach. The case presented here started with an orthodontic phase followed by a restorative one. The aim of the orthodontic phase was to achieve the correct spacing, respecting ideal average tooth proportions. This was done using a digital setup to restore the six anterior teeth, so that an optimal esthetic and functional result was achieved by the end of the orthodontic treatment. The purpose of the restorative phase was to contribute to the esthetic outcome and occlusal stability. The 12-year-old patient was treated utilizing a CAD/CAM procedure, which took advantage of the mechanical properties and reasonable cost of the chosen resin matrix ceramic material (Vita Enamic). Once stability has been attained and proper periodontal tissue maturation has been reached at the end of the patient's growth, there will then be the option of improving the esthetics by replacing these restorations with ceramic veneers. New adhesives and bonding techniques. Why and when? Nowadays, adhesive dentistry is a fundamental part of daily clinical work. The evolution of adhesive materials and techniques has been based on the need for simplicity in the step-by-step procedures to obtain long-lasting direct and indirect restorations. For this reason, recently introduced universal multimode adhesives represent a simple option for creating a hybrid layer, with or without the use of phosphoric acid application. However, it is important to understand the limitations of this latest generation of adhesive systems as well as how to use them on coronal and radicular dentin. Based on the findings in the literature, universal multimode adhesives have shown promising results, even if the problem of hybrid layer degradation due to the hydrolytic activity of matrix metalloproteinases (MMPs) still exists. Studies are therefore required to help us understand how to reduce this degradation.